Social workers and NGOs today claimed that minority community students in Punjab were not able to take advantage of various central scholarships because the District Education Officers (DEOs) were not following the instructions of the State Welfare Department. The Mansa Municipal Council has failed to recover the house tax of nearly Rs 1.75 crore from various private and government buildings for the past more than a decade. Heavy rainfall in Patiala since today morning left several city areas inundated. While the traffic jams were the order of the day, people in villages situated along the Ghaggar fear worst in case it continues to rain. An attempt by the Shiromani Akali Dal to pass a resolution in the state assembly demanding commuting of Devinderpal Singh Bhullar’s death sentence to life imprisonment is unlikely to see the light of day with the Punjab BJP not playing ball. Punjab BJP sources said they would oppose any such resolution, as it would amount to adoption of double standards by the party at the Centre and the state. To boost the electoral prospects of the Panthic Morcha candidate for the SGPC poll, Roop Singh Gurisanghar, Punjab People’s Party (PPP) leader Manpreet Badal today addressed a series of election rallies in this segment, that has become prestigious for him and the Chief Minister. The Barnala (general) constituency has been witnessing a keen contest this time. And hogging the limelight is Sant Baba Tek Singh Dhanaula, who was once considered as a confidant of Chief Minister Parkash Singh Badal. He fell out with the Badals reportedly after a spat with Akali leader Sukhdev Singh Dhindsa over the management of a school. Jagjit Singh Talwandi, former chairman of the Punjab Small Scale Industries Corporation and the elder son of SGPC former president Jagdev Singh Talwandi, has been fielded as the SAD (B) candidate from Raikot. The family has been continuously representing the constituency in “mini parliament” of Sikhs. Blows were exchanged and abuses hurled at one another at a Congress dharna outside the office of the DC here today. PPCC president Capt Amarinder Singh today condemned the "fake" and "imaginary" economic figures presented by Deputy Chief Minister Sukhbir Singh Badal at a press conference in Jalandhar saying the latter should have had a look at his own government's papers before going public about it. A video of Shiromani Gurdwara Parbandhak Committee (SGPC) president Avtar Singh Makkar using derogatory language for former Akal Takht Jathedar Ranjit Singh is making rounds on social networking site Facebook these days. Uploaded on Youtube and other social networking sites a few days ago, the video was shot when Makkar was replying to a question related to his petrol expenses. Pickpockets are thriving on the numerous rallies being held by political parties in the run-up to the SGPC and assembly elections in the state, so it seems. With the daring thieves picking on politicians, celebrities, mediapersons and even policemen, a senior politician confessed that he and several other leaders had stopped carrying their wallets to the rallies. Besides cell phones, wrist watches, cash and ATM cards, shoes have reportedly gone missing at the rallies. In a bizarre incident, a municipal councillor of Patiala allegedly thrashed a female teacher of an elementary school in full public view. The teacher was later admitted to the Rajindra Hospital for treatment. The Tripri police has registered a case in this regard on the complaint of the teacher. Baba Farid University of Health Sciences (BFUHS), Faridkot, will hold the second counseling for admission to MBBS/BDS at GGS Medical College, Faridkot, on September 24. At a time when cement companies are battling the menace of sale of spurious cement under trademarks closely resembling those of reputed brands, a commissioner appointed by the Delhi High Court today inspected a cement factory in Sodhewala village in the district. The Patiala police has registered a case under the Narcotic Drugs and Psychotropic Substances (NDPS) Act against the SAD, Amritsar, office bearer and have allegedly recovered 1,000-kg contraband stored in his house. The Punjab and Haryana High Court yesterday called for “fair investigations” in “all types of killings” after observing that the death of the famous and the powerful cause “turmoil”, but the killing of some others gets “muted” or “subdued”. The department has issued advertisements asking people to contact their respective DEOs to apply for the pre-matric scholarship for minority students. However, the NGOs claim the DEOs are turning away all scholarship applications. The Satnam Sarb Kalyan Trust today urged the government to instruct the DEOs to entertain all eligible applications. Trust member Satwant Singh Gill said the organisation, which was working in 267 schools, had submitted 10,000 applications for pre-matric scholarship last year. Gill said the DEOs of Amritsar, Ludhiana, Sangrur, Barnala and Gurdaspur were claiming that they would take applications from government school students only as they did not have specific directions on the scheme. He said this stand was despite the fact that government advertisements clearly said that students of all recognised and private schools were eligible. Another social activist Dr Surinderbir Singh from Ludhiana urged that the last date for submission of scholarship applications be extended. Congress legislature Party leader Rajinder Kaur Bhattal said the State Finance Department had shown utter callousness in not releasing the money to needy students. She claimed that this was not the sole instance of mismanagement of Central funds. “The SAD-BJP government is not implementing many other schemes funded by the Centre,” she added. The amount is increasing as rate of interest keeps on adding each year. As per information procured under Right to Information Act by Vinod Kumar, a resident of Mansa, the amount to be recovered from the government buildings has crossed Rs 70 lakh and more than Rs 1 crore from private buildings. While the Mansa Deputy Commissioner owes house tax of Rs 20 lakh and the SSP owes Rs 9 lakh as house tax to the Municipal Committee. Besides the Deputy Commissioner and the Senior Superintendent of Police, the information reveals that DTO, ADC, district welfare office, District Education Officer (secondary), panchayat samiti, zila parishad, civil hospital and many other government departments that are in the list of defaulters. There are many influential private people who have declined to pay house tax over one pretext or the other. The total amount to be recovered from the government buildings is Rs 69,55,012, which includes Rs 5,02,664 as rate of interest. The house tax on private buildings is Rs 1.7 crore. Maximum amount of Rs 2,69,825 is to be paid by the Mansa police, besides other government departments in the district. President of Mansa Municipal Council Atamjit Kala rued that despite writing umpteen times to the police and civil administration, nothing has been done to pay the house tax. The Municipal Council officials said many pending developmental works by the Municipal Council could be done if the money is recovered. Vinod Kumar, who procured the information, said the Municipal Council, too, is supposed to pay money to the tune of many lakhs and some of its employees have moved the court in view of their pending dues. “If the house tax pending with the government and the private people is recovered, many pending works of the committee could be done,” he added. The total amount to be recovered from the govt buildings is Rs 69,55,012, which includes Rs 5,02,664 as rate of interest. No causality has been reported so far, but there are reports that students in some government schools have to face a lot of difficulties on account of several feet water in the building premises on account of the poor drainage system. "We have got to know from the radio that the monsoon rains will continue till next four-five days. In that case, the threat of the flash flood looms large. If the Ghaggar overflows, the Hansi-Buatana canal will obstruct the natural flow of water and it will definitely push the water backward leading to floods in around 36 villages,” said Satnam Singh Boparai of Haripur village, which is situated along the Ghaggar. "The ongoing work at the national highway and poor drainage system creates a lot of problems every time it rains,” said Satpal Kaur, one of the teachers at the Government Elementary School, Parao village, Rajpura. “There were no classes today in the school as the students and teachers were struggling to find space to sit,” she added. An attempt by the Shiromani Akali Dal to pass a resolution in the state assembly demanding commuting of Devinderpal Singh Bhullar’s death sentence to life imprisonment is unlikely to see the light of day with the Punjab BJP not playing ball. Punjab BJP sources said they would oppose any such resolution, as it would amount to adoption of double standards by the party at the Centre and the state. The BJP has demanded that the death sentence awarded to Parliament attack accused Afzal Guru be carried out and it cannot be seen to be taking an opposite stand in case of Bhullar. Punjab BJP legislature party leader and Local Government Minister Tikshan Sud said the SAD had not held any discussion on the issue. He said the party had a consistent stand on the issue irrespective of the names involved. He, however, said if the SAD proposed adoption of a resolution favouring life imprisonment for Bhullar, the state unit would take a stand after referring the matter to its high command. Veteran BJP leader Balramji Das Tandon, however, was more blunt. He said the BJP had made it clear that it was not in favour of remission of the death sentence. Tandon said, moreover, there could not be any soft corner for militants as Bhullar, too, was responsible for many deaths. Tandon said a coalition did not mean that views of both parties should be the same on every issue. He said the government was running as per a common minimum programme and that both parties could have different opinions on various issues. Meanwhile, sources said that under the present circumstances, the government might not table the resolution in the forthcoming assembly session. With Chief Minister Parkash Singh Badal already announcing the government’s intention to table a resolution in this regard, the government might go in for some other measure to express solidarity with Bhullar. Earlier, veteran leader and party incharge for Punjab Shanta Kumar had also claimed that the party would not back the mercy plea of any militant. The situation is likely to embarrass the akalis as Pradesh Congress President Capt Amarinder Singh has spoken out in favour of commuting Bhullar’s death sentence. Various Sikh bodies, including the Dal Khalsa and the All Indian Sikh Students Federation (AISSF), have also urged the government to pass a resolution to this effect. Bhullar was convicted for carrying out a bomb blast in 1993 in New Delhi aimed at the then president of the Youth Congress, Maninderjit Singh Bitta. Though Bitta survived, nine people were killed in the blast. The President has rejected his mercy petition. Popular comedian Bhagwant Mann also addressed rallies in favour of Roop Singh. Chief Minister Parkash Singh Badal had yesterday addressed a rally in support of SAD candidate Navtej Singh Kauni. Manpreet, however, denied that he was campaigning for the SGPC elections. He claimed he was preparing for the assembly elections scheduled for early next year. The Dodha segment of the Gidderbaha assembly constituency, earlier represented by Manpreet, has over the years emerged crucial. Parkash Singh Badal represented the constituency for 16 years from 1969 to 1985 and later gave the ticket to Manpreet in 1995, who represented it till last year when he resigned after being expelled from the SAD. The SAD and the PPP are now making every effort to win the Dodha seat in the SGPC elections. Addressing a gathering at Kauni village, Manpreet claimed that the rival SAD candidate Navtej Singh was on a “very weak” wicket. He alleged that SAD activists were coercing the electorate to vote for Kauni, “an unwise strategy to get votes.” He said Om Parkash Chautala had used this strategy in Haryana and lost the elections. “ It is possible that the Chief Minister and the Deputy CM may not even be aware that the SAD activists are indulging in such undemocratic activities,” he maintained. Addressing a rally in Bhaliwana village, Bhagwant Mann described SGPC chief Avtar Singh Makkar as a puppet whose strings were in the hands of the Badal family. He urged the people to vote for Roop Singh to free the SGPC from those “misusing” gurdwara offerings and funds. Chandigarh: PPP chief Manpreet Badal has claimed Deputy Chief Minister Sukhbir Singh Badal was making “foolish” statements on economy matters and had wrongly claimed that Punjab’s growth was the second highest in the last four years. Manpreet, in a statement, said even the growth of 7.5 per cent projected by the Deputy CM was dubious. Dhanaula is being supported by Tamil Nadu former Governor and Badal "rival" Surjeet Singh Barnala, whose party SAD (Longowal) has given him the ticket. He is locked in a triangular contest with Paramjeet Singh (SAD-Badal) and Gurinderpal Singh Dhanaula (SAD-Mann). The segment, comprising Barnala town, Handyaya and 23 other villages, has 49,102 voters, with over 50% of them being women. He says, ""I carried out Amrit Sanchar (complete transformation of Sikhs who live their lives as per the principles of Guru Gobind Singh) of several Sikhs, financially helped orphans and widows, constructed Naoveen Patshahi Gurdwara, started schools for religious teaching." He claims voters are upset by the "misrule" of the Badals and "corrupt practices" of Sukhdev Singh Dhindsa and his PWD Minister son Parminder Singh Dhindsa. Contesting from the constituency for the third time, he made it to the SGPC in 2004. "I was targeted by Sukhdev Singh Dhindsa as I refused to sign on a resolution pushed by him for the transfer of six acres of land belonging to the SGPC near Barnala in the name of his son-in-law and his supporters. He also lodged cases against me when I opposed his move to take over Baba Gandha Singh School and forcibly occupied the post of acting chairman of the school." About his agenda, Baba Tek Singh says: "If elected, I will make every effort to move more Sikhs towards Gur Sikhi (complete Sikhism), work towards spreading the Sikh religion, eradicating drug addiction and repair of gurdwaras outside Punjab and the country, which are lying in a dilapidated condition." His day begins at 5 am when he starts campaigning in villages and returns at around 4 pm and later holds poll meetings in Barnala town, comprising around 15,000 voters. Significant both politically and religiously, Raikot constituency is witnessing a triangular contest. For a victory, Talwandi would have to beat close rival and Panthic Morcha candidate Sukhpal Singh Goindwal and Independent contestant Rajwinder Singh. Initially there were four candidates. But, Parminder Singh Jattpuri withdrew in favour of Talwandi. Jagjit would be the third generation member from his family in the SGPC in case he makes it. His father Jagdev Singh served as the SGPC president, his grandfather Baba Fanga Singh was elected as a member in the maiden election to the body in 1926. Talwandi claims to have imbibed “true Sikhism” from his father and aims to work against the mushrooming of ‘deras’ in the state. Having observed that majority of followers of various ‘deras’ were from the lower strata of the Sikh community, Jagjit plans to propose the establishment of cooperative societies at gurdwaras being managed by the SGPC. With very little to be spoken personally against Jagjit Singh Talwandi, his rival Goindwal’s supporters accuse the family of having done nothing for the Sikhs of the area despite representing the constituency for a long time. “Someone or the other from the Talwandi family has been in the SGPC since its constitution. Still, nothing significant has been done for the Sikhs of the constituency by them. They should have at least impressed upon the SGPC president to open some nursing or medical college in the area,” says Lakhwinder Singh Sapra, a local resident who has been campaigning for Goindwal. The protest was held against the “forcible” acquisition of land by the government. Led by former PPCC secretary Davinder Sachdeva and former PPCC general secretary Jaspinder Singh Jakhar, a large number of Congress activists reached the dharna site. Activists of rival factions grabbed the mike from one another in a bid to take over the proceedings. In the melee, several persons, including Congress leader Capt MS Bedi, were injured. Capt Bedi was shifted to the Civil. Former MLA Rinwa was reportedly admitted to a private hospital. In the meantime, outgoing Youth Congress district president Sandeep Jakhar reached the dharna site and pacified the workers. After a while former minister Hans Raj Josan, former MLA of Balluana Parkash Singh Bhatti and dharna coordinator and former Congress minister Avtar Singh Brar also reached there. The leaders pacified the party workers and the dharna began only at noon. As tension persisted, the dharna was lifted after about an hour even as party workers from other assembly segments of Fazilka marked their presence at the protest site. “More police personnel were deployed at the dharna venue when tension between the Congress factions increased to help defuse,” said Fazilka SSP RK Sharda. Brar said the scuffle among the workers had occurred before his arrival at the venue. He would look into the matter and report to the Congress high command. Since the dharna was staged on the highway outside the DC’s office, traffic remained blocked for hours. Quoting the budget document of the state government, "Punjab Budget at a Glance 2011-2012", Amarinder disclosed that on page 11 of the document it was clearly mentioned that the "public debt on the state government", according to the budgetary estimates for 2011-2012, was Rs 77,585 crore. "The same document mentions on page 9 that total state PSUs' debt and guaranteed debt as on March 31, 2011 is Rs 55,262.19 crore," he said. The PPCC president said the total debt of the Powercom (earlier PSEB) stood at Rs 20,000 crore, which had been guaranteed by the state government. Besides, the state has to pay arrears worth Rs 6,000 crore to its employees due to them on account of the Pay Commission's recommendations. The video, titled as “Dekh Hamaara Haal…”, was uploaded by a user named Satpalsinghk on September 10. It has been viewed by 14,484 people till date. In the video, Makkar, is seen talking to someone over the phone and is passing derogatory remarks against Bhai Ranjit Singh, former Akal Takht Jathedar and Delhi Sikh Gurdwara Management Committee president Paramjit Singh Sarna. He even accused Bhai Ranjit Singh of grabbing SGPC property and says that he would bury him into earth. Bhai Ranjit Singh said that the property, which Makkar is accusing him of grabbing, was given to him after passing a resolution. “If they (SGPC) pass another resolution that they want this property (house) back, I would return it that very day. And regarding the issue of burying me in earth, I laugh when I hear that Makkar is making these statements,” he said. Commenting on the issue, Makkar said he was reacting sharply because Sarna and his group were levelling baseless allegations on him. “When they didn’t find anything wrong against me, they have started uploading such videos over the internet. I didn’t use such language intentionally and maybe I was not in a good mood at the time when this video was made. Who is Sarna to comment on it.” when everyone knows the kind of language he uses,” said Makkar. 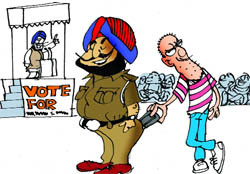 Pickpockets are thriving on the numerous rallies being held by political parties in the run-up to the SGPC and assembly elections in the state, so it seems. With the daring thieves picking on politicians, celebrities, mediapersons and even policemen, a senior politician confessed that he and several other leaders had stopped carrying their wallets to the rallies. Besides cell phones, wrist watches, cash and ATM cards, shoes have reportedly gone missing at the rallies. A couple of pickpockets caught by the public near Punjabi University during a Congress function here said they obtained information about the rallies from newspapers. Religious and political functions, where there were large crowds, were the primary targets of pickpockets, said Khanna DSP Devinder Singh Dhuri. Surinder Khosla of Ghumman Nagar, a Congress supporter, was robbed of Rs 1 lakh during Anandpur Sahib MP Ravneet Bittu’s visit to the city recently. “I decided to attend the MP’s fuction after sealing a business deal. This proved disastrous. I lost Rs 1 lakh in cash. My complaint is pending with the police,” he said.Punjab People’s Party president Manpreet Badal’s wallet was stolen at the Khatkar Kalan rally near Nawanshahr in March. Such thefts were also reported during a function in Chandigarh when Capt Amarinder Singh took over as PPCC chief. Police data shows that five to 10 cases of pickpocket are invariably reported after each political gathering. The actual number could be more. A senior police officer said instead of lodging an FIR, the SHOs often pressed the complainant to lodge a “missing” report. During Chief Minister Parkash Singh Badal’s visit to Dana Mandi here a few days back, the pocket of a Head Constable on duty was picked and he lost Rs 1,800 in cash. A mediaperson lost his wallet in the rally too. The incident occurred yesterday when Amandeep Walia, who is working at the Rasulpur Saidan Elementary School in Tripri, allegedly went to the market yesterday after giving an application and when she returned to the school, the councillor of ward no 12 Rajinder Virk allegedly thrashed her. Talking to mediapersons, Amandeep alleged that she had some urgent work in the market and had left the school after submitting an application with her colleague, but when she returned, the councillor was already sitting in the school. “After the school time was over, I went to the office to sign the attendance register and the councillor snatched it from my hand stating that I could not sign it as I had gone out of the school without informing anyone. When I tried to question him, he bashed me badly in front of the entire school. Teachers and students interfered in order to save me and admitted to the Rajindra Hospital,” she added. On the other hand, the councillor refuted all the charges stating that the teacher was levelling false charges just to save her skin. “She was absent from the school when the chairman and few other members reached the school for inspection,” he added. DEO (Elemantary) Balbir Kaur Gill said the school was under the zila parishad and she had reported the matter to the department concerned in this regard. Meanwhile, sources informed that the councillor had been pressurising the authorities to transfer the teacher since long for vested interests and when they did not do it, he deliberately took this step to embarrass her. The spokesperson of the university informed that they would conduct counselling for four days and the university would have to fill the seats for the candidates of NRI students and other candidates of reserved category first and would transfer the leftover seats to the general category. According to schedule issued by the university, counselling of NRI seats of Government Colleges, SC (PMET Marks 320 and above), BC (PMET Marks 430 and above), orthopaedically Handicapped (PMET Marks 360 and above), other reserved categories (PMET Marks 400 and above) will be held on September 24 in the morning session from 8.30 am onwards. The general category students, who have obtained 500 and above marks in PMET, have been called for counseling on same day at 12.30 pm. The counselling of the MBBS seats will continue on September 25 for those students who have obtained 499 to 440 marks in PMET. Similarly, the counseling of NRI and other reserve category students would be held for BDS seats from September 26 onwards. The three-hour inspection yielded a large quantity of empty and filled bags that were a look-alike of those used by reputed companies. Shiv Cement Company was found selling cement under the ACG, Ultra-Plus, Ultra Hi Tech and Shree Cement trademarks-most resembling those of reputed brands with an identical font and colour scheme. The court ordered the inspection after ACC Ltd alleged that Shiv Cement Company was using the trademark ACG that had been deliberately designed to closely resemble that of ACC. The ACC produced empty cement bags in the court to prove its point. 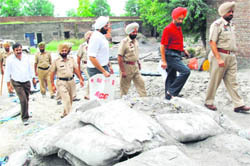 Commissioner Angad Narula said: "The inspection has revealed that not only ACG cement bags, but a large number of other cement bags with trademarks like Ultra-Plus, Ultra Hi Tech, Vijay Shree Cement are a look-alike of that of reputed brands. "All these bags, empty and filled, have been sealed as directed by the HC." Duty Magistrate Manjit Singh and a police team headed by SHO Gurinderjit Singh accompanied the local commissioner to the factory. Owner of Shiv Cement Factory Sanjeev Kataria said they had done nothing wrong. "All trademarks are duly registered with the competent authorities," he maintained. Kataria claims to be the district president of the "Anti-Corruption and Social Workers' Organisation, Punjab," as is evident from a plaque at the main gate of the factory. Kumar Bankatesh, ACC counsel, said factories like the one in Ferozepur were located in rural areas where most customers were unable to distinguish between the original brands and the look-alike brands. The retail outlets selling "dubious cement" made huge profits, he said. 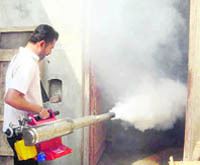 There had been several incidents when buildings had collapsed because of substandard cement and the owners had registered cases against reputed cement companies, he added. Justice K. Kannan also passed strictures on the Punjab Police for adopting a “hands-off approach” and directed the crime branch of the Punjab Police to hold the investigation in a Bathinda resident’s murder whose father was an ex-minister. The probe will be carried under the direct supervision “of the chief police functionary of the crime branch”. The directions came on a petition filed by Jasleen Kaur of the Bathinda Civil Lines for transfer of her husband Sandeep Singh’s murder case to the CBI. In her petition, she had claimed receiving information that two persons, accompanying her husband, had shot him down. Claiming that they were seeking the lease of his lands, the petitioner had added valuables, including gold bracelet, ring, mobile phone and watch, were removed from the victim’s body. The petitioner had gone on to add that one Jagtar Singh of Bathinda was behind the murder and had connived with the two to avenge the death of his brother Harpal Singh and their servant. The petitioner’s husband had already been tried and convicted for the offence, she had added. The FIR in the case was registered on August 2, 2009.